Software allows to user to search particular text within PST file. The Output PDF file can be Printed using inbuilt Print option. 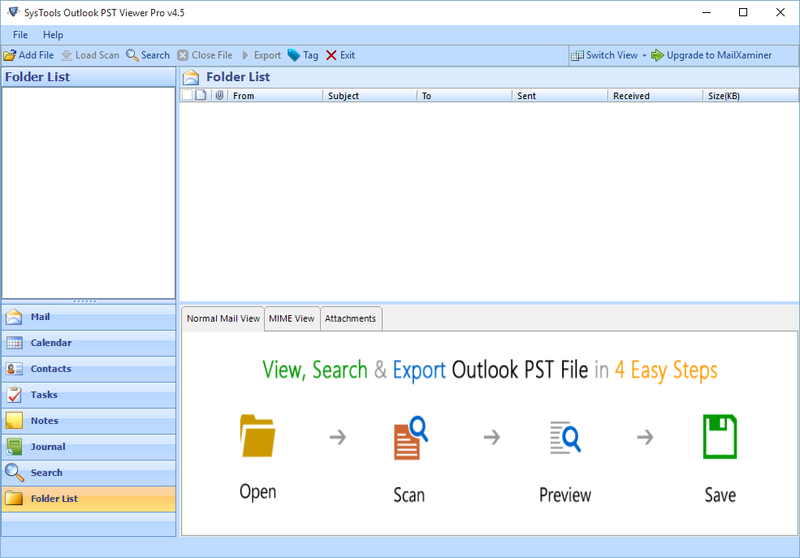 Outlook PST Viewer Pro application allows viewing and analyzing PST files of all types. You can view ANSI / Unicode PST files in healthy, corrupted, as well as password protected (not known) form without restrictions. The PST can be conveniently browsed from any desirable source location. Software features scan modes for examining PST file. The Advance Scan deeply scans the entire PST file items with detail analysis of each item included. When scanning a PST file you can choose to index the items found while scanning. This way all the folder and items of the selected PST will get listed in a tree structure view along with item count. Only Advance Scan offers the choice to index your scan results. All items of the selected PST file can be previewed and exported to PDF. The items exportable to PDF includes; Email, Contacts, Calendars, Tasks, Journals, and Notes. A separate PDF file will be created for each Outlook PST Email, Contact, Calendar, etc. ; respectively. A common naming pattern can also be set for each. Scanned PST file will get listed with all the items / folders / subfolders arranged in a tree structure. You can preview each and every item within the folders along with their fields. Selecting any of the folder or item from folder list will highlight its item count next to it (in case of non-indexed scan). You can preview the PST email data in multiple views. Normal Mail View shows the header details and email body. 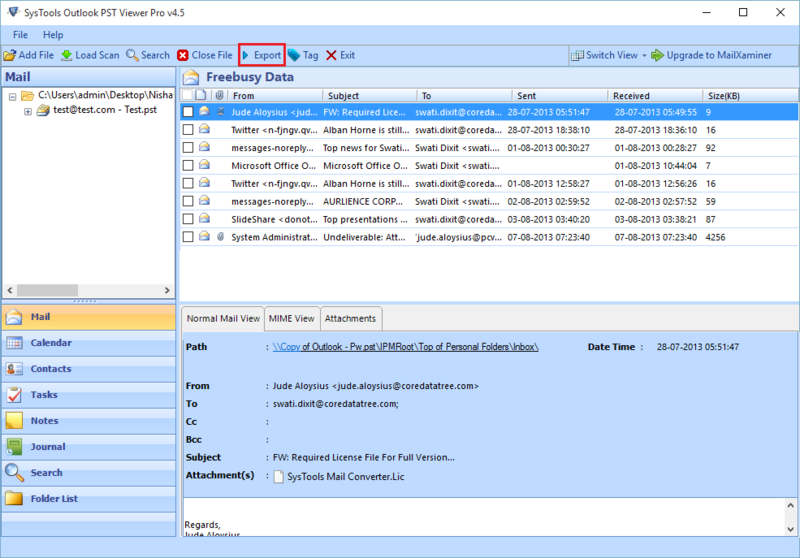 Property View categorizes each section of an email and displays its technical and backend information. And Attachment(s) can be previewed separately under the Attachment tab. 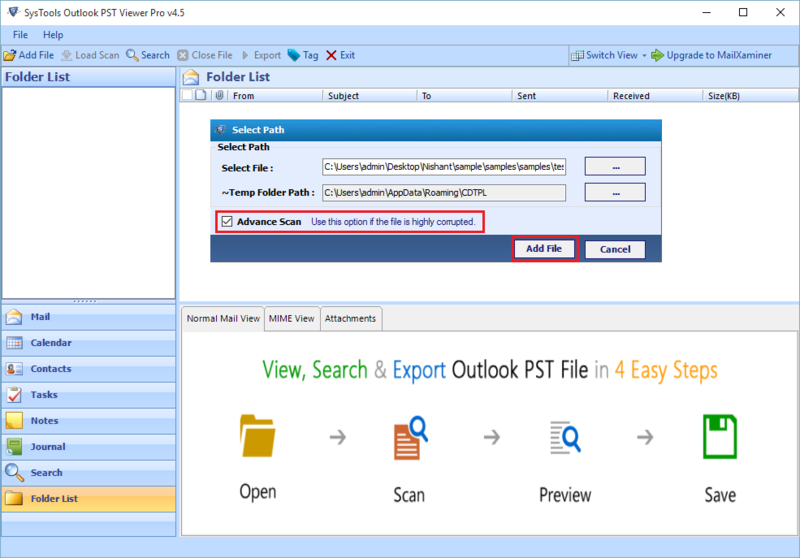 The Outlook PST Viewer Pro offers multiple patterns for naming the output PDF file. You can select from options like: Auto increment, subject, date, from, or the later three options arranged in variety of orders. The selected naming convention will be set as common for all the items being exported to PDF. The scanned items of PST file listed on software preview panel can be arranged in a desired order. You can organize items in an ascending or descending order of arrangement using any of its attributes. This may include: From, Subject, Receive, Size (in KB), Full Name, Business Phone, Start, End, Categories, etc. Using a term / word you can search for emails or attachments within the selected PST file. Also, search criterion and conjunctions can be added to perform a detailed search. Using Auto Preview option you can get a brief preview of the items listed in results. Plus, you can save, open or clear your searches accordingly. You can perform a selective export of multiple items or folders at once. From the software preview panel select the files you want to export and proceed with export. And to export folders, simply click on export and choose desired folders to be exported from 'Select Folders' section provided on export window. Outlook PST Viewer Pro is a standalone application. Hence, you do not require installing Microsoft Outlook client on your system for successfully running the software to view and analyze PST file items. As part of the export procedure, the application additionally features an option to generate a printed copy of the selected emails. By using this option, you get to create a hard copy of the email by printing it directly using the software. How can i convert PST files to PDF in batch ? 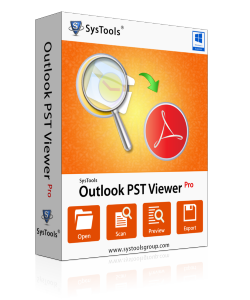 Download and Install Outlook PST viewer Pro software. Add and locate the necessary PST file to the software. The file structure would be shown in the software on left hand side. The file will be saved successfully. Does the tool support Windows 2008 R2 Server? Yes, software supports all Windows versions including Windows XP, VISTA, 7, 8,10 Windows Server 2000, 2003 and 2008. In the Outlook PST Viewer, is there a maximum number of key words that can be used in a single search? There is a limitation of "32767" characters that can be typed in a textbox. However it is very inconvenient to type in or copy paste huge number of keywords into a textbox. In the next version, advance keyword search filter will be incorporated soon. How can I purchase this tool and get the license? You can purchase the software by online shopping using Credit/Debit Card or Internet Banking. You can also get it directly from our sales team. You will get the licensed version via e-mail within 5-10 minutes after making purchase. Does the application needs the installation Of Outlook. Can I add multiple PST files at once or do I need to add them individually (one at a time)? I have 10 PST files that I want to view while perform search in 5 of them with one query. Is this possible? You can add multiple files one by one but not all at once for scanning. Also, it but can search within multiple PST files at once. What is the function of Advance Scan? Advance Scan mode scans each sector of the file deeply. Normally, Advance Scan is used when all the data doesn't get recovered by default scanning. It takes more time than default Scan. Is there any PST file size limitation to use this product? No, software does not have any size limitation imposed on PST files. You can scan, view, search and export any size of PST files. Can this tool work with PST files located on a Network File Share? Software will process PST file from any source location. Network drive is also included as one of them but it will take more time to complete it. So, we recommend our users to copy PST file from Network Drive to Local Drive and then use them. Does the tool also support PST files created in Outlook 2016? Yes, software supports PST files created from all versions of Outlook like: 2002, 2003, 2007, 2010, 2013 as well as 2016. Is it possible to export the examined data to another PST using this tool? No, Software will only export PST file into PDF format. Does the Pro version allow printing emails directly without exporting to PDF? No, you can't take prints of emails without exporting them into PDF. First you need to export emails, contacts; calendars or other desired items of PST into PDF format then only you can take its print. Are email attachments also converted to PDF format? Software will convert emails into PDF format while embeds the attachments in their original format into the respective PDF file itself. You can see attachments by clicking on "Paper Clip" icon and further download them as well. Are email of corrupt/password protected PST file exportable? I have a password protected PST file but I forgot its password. Can I still export emails from it to PDF as it contains many important emails? Yes, software features scanning ; Advance Scan. You can use the mode of scan according to the level of corruption in the PST. The recovered data can then be exported to PDF. Software also processes password protected PST files without asking for the password. Tool is asking for Indexing the file before scanning while I search or scan the PST file using advance mode. What is it? Indexing is a procedure of arranging scanned items of PST file in the exact order as they were arranged within the file. When using Advance Scan option for viewing PST file is used, Outlook PST Viewer (Pro) asks whether you want the scan results to be indexed or not; choose accordingly. To improve and speed up item search; Index your Advance Scan results. It helps to retain the order of PST file components and folders that are listed alongwith the item count shown. 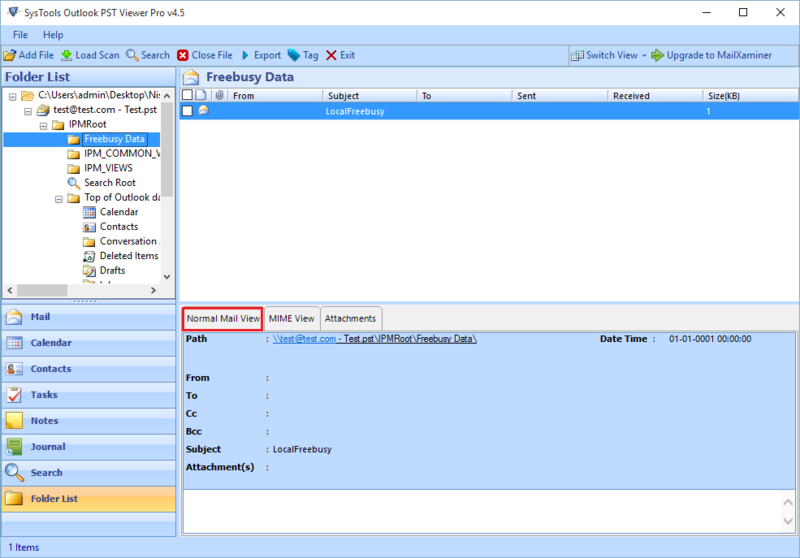 PST Viewer Pro Plus not only lets you view healthy/corrupt PST file but also repairs it. Further, the data can be saved into a new PST file or any of the other file types featured by the tool. The software offers conversion facilities one of which is PST into MSG conversion. The PST emails once viewed/recovered can be saved into individual MSG format files. You can also save your Outlook PST file data into a PST file type. The output PST file created is of Unicode file type that can be used with all the latest version of Outlook including; 2013. Size of the output PST can be managed using the split option where you can provide the desired size to split PST. Split by size option is enabled while saving as PST. Using the PST Viewer Pro Plus, you are provided with the option to save PST as EML. Selective or the entire set of emails can be saved in an individual EML file type each. There were so many PST files but no platform to view them as we were no more working on Outlook. However, Outlook PST Viewer worked great by providing the preview and export to PDF option!